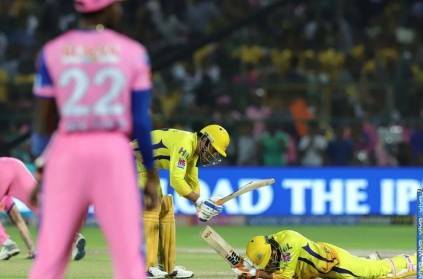 As Dhoni was struggling with his fitness, Jadeja was on strike against Stokes off the last over as CSK needed 18 of it. It was very crucial that they get off to a good start to the over chasing 18 and hence the first ball was very important. Stokes delivered a full ball as Jadeja played the strangest of shots as he slipped, fell down but still managed to make contact and hit the ball for 6!!! This was a game changer and was a hilarious moment too. Dhoni from the non-striker's end, really enjoyed it as well, as he ran to the striker's end and had a laugh about it as he was tapping Jadeja on the helmet with his bat for fun. Watch Video - Superfast Stumping from Super King Dhoni!!! It just took that many seconds!!! This page contains news relating to various facts and events. The views are generally about current affiars and general topics in diversified areas such as political, international, national, and regional issues, sports, health, travel, lifestyle, technology and business. People having similar interets on the above topics will find this page useful. Jadeja hits a funny six and Dhoni hits him on the head. | Sports News.